Copying the necessary functions from the last two exercises. 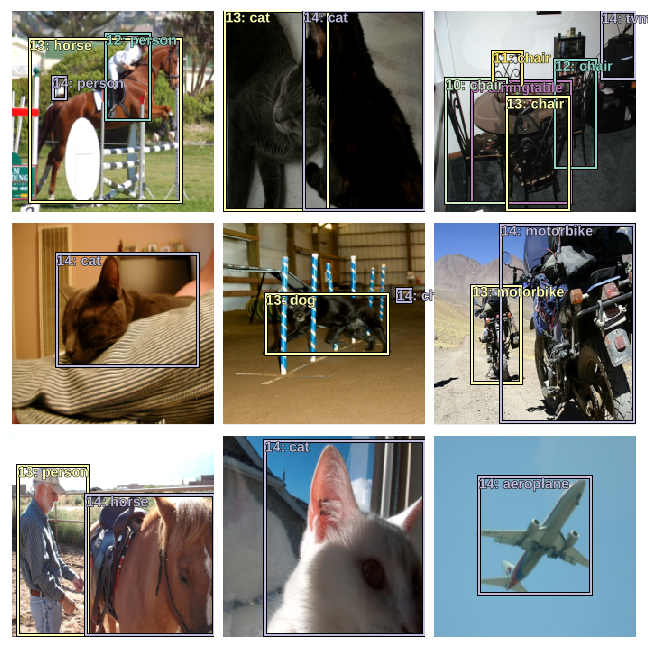 For single object detection we set up the dataset such that it returned y as a list of (bounding box coordinates, class). For multi-object detection, we'll use the same approach with the difference that this time there can be multiple objects for one entry in y. 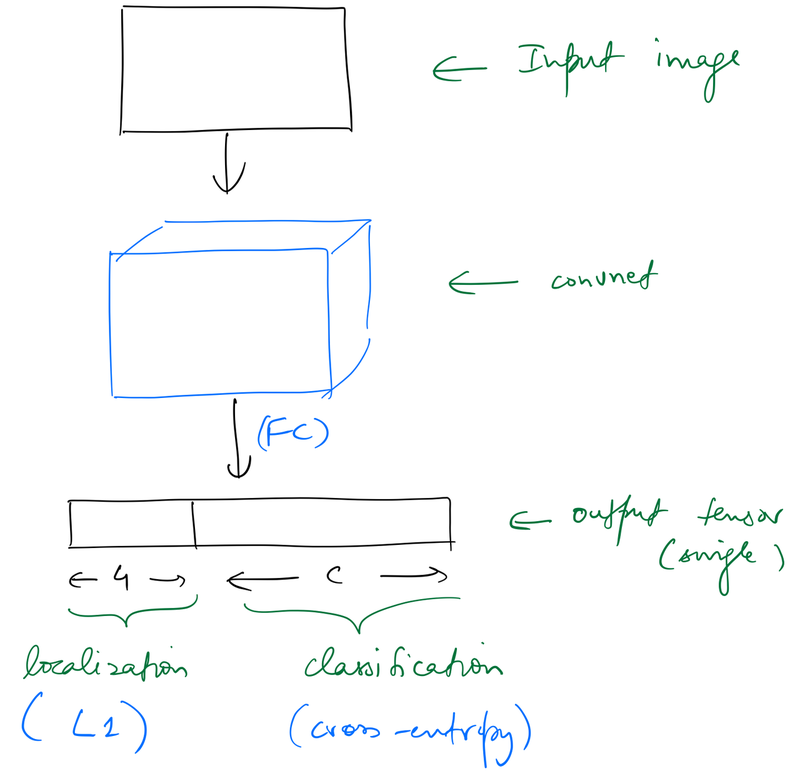 For classification task we need to set up an array that maps image_training_id to an array of category_ids which follow a standard category-to-id mapping convention. 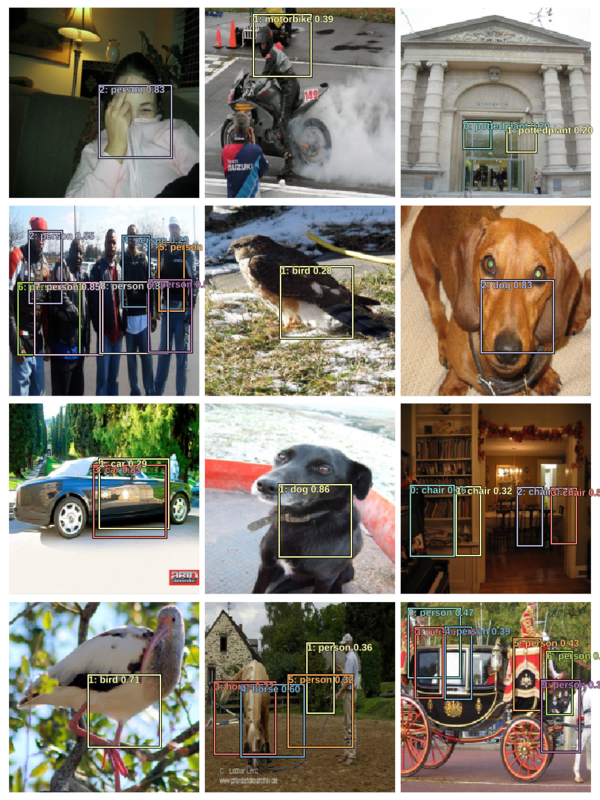 mc is a list with the same length as trn_ids, and contains the names of categories of all objects contained in an image. cat2id is a dictionary that maps a class name to a number. This convention will be used during training as well as inference. For localization we'll map bounding box coordinates with image file name. This is same as before, with the difference that this time we'll concatenate all bounding boxes instead of choosing just the largest one. Ground truth data is ready to be used as a PyTorch Dataset. We'll use the same technique of concatenating the two datasets as before. Setting up some utilities to be used for plotting different colored bounding boxes and labels. Let's take a look at the training data. 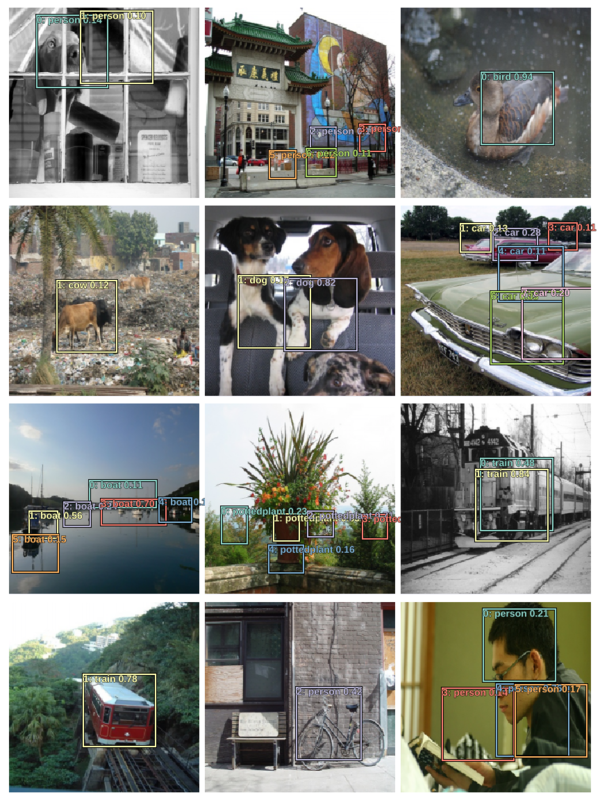 Let’s take a look at the output activations of the network used to classify and localise one object in an image. The network outputs a tensor of shape (batch_size, (4+c)), where c is the number of categories. This kind of architecture can be extended to identify multiple objects, say 16, by simply having a set of 16 different output activations as before, ie, having an output tensor of shape (batch_size, 16, (4+c)). Obviously, we would need a loss function that would appropriately map these 16 (4+c) activations to the ground truth, but assuming we do, this approach would work. Another way to solve this problem would be to replace the linear layers in the custom head with a bunch of convolutional layers. Taking the example of 16 target objects as before, we can have a Conv2d layer with a stride 2, and (4+c) filters, as the custom head, which will convert the output tensor of the backbone (having shape (batch_size,7,7,512) in the running examples) into a tensor of shape (batch_size,4,4,(4+c). There are exactly the same number of output activations in the two approaches, but the difference between the two is that the latter retains spatial context due to the nature of the convolution operation. 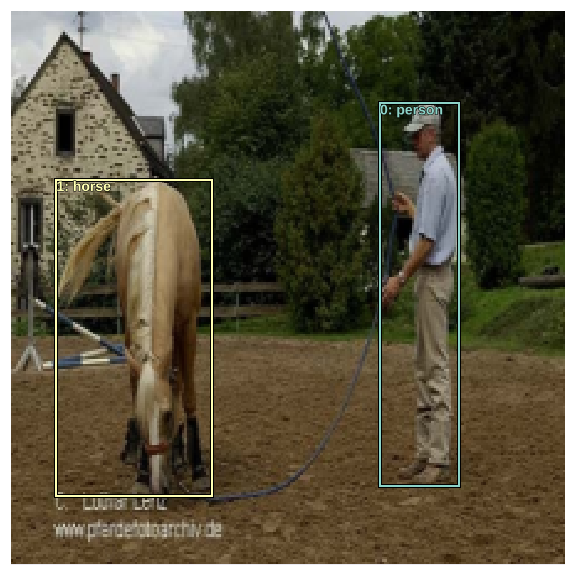 I’ll focus on the second approach in this post, which is based on SSD: Single Shot MultiBox Detector by Wei Liu, Dragomir Anguelov, Dumitru Erhan, Christian Szegedy, Scott Reed, Cheng-Yang Fu, and Alexander C. Berg. 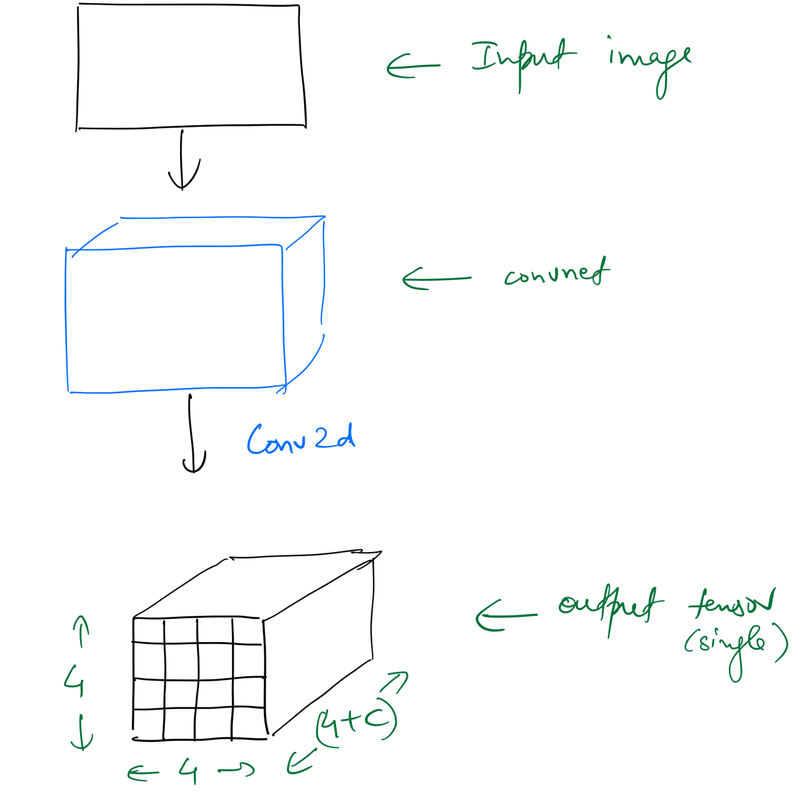 If we add another Conv2d layer to the custom head, we get a tensor of shape (batch_size,2,2,(4+c). This shape lets us map the four cells of this (2 x 2) grid to 4 quarter sub-sections of the input image by leveraging the “receptive field” of these cells. The reason we can do this is because throughout the convolutional layers, each element of an output tensor is derived from a specific part of the input tensor, which is called it’s “receptive field”. As a result, we say that the first cell of the (2 X 2) grid should be responsible for finding an object in the top-left quarter sub-section of the input image. We associate a set of default bounding boxes with each feature map cell, for multiple feature maps at the top of the network. 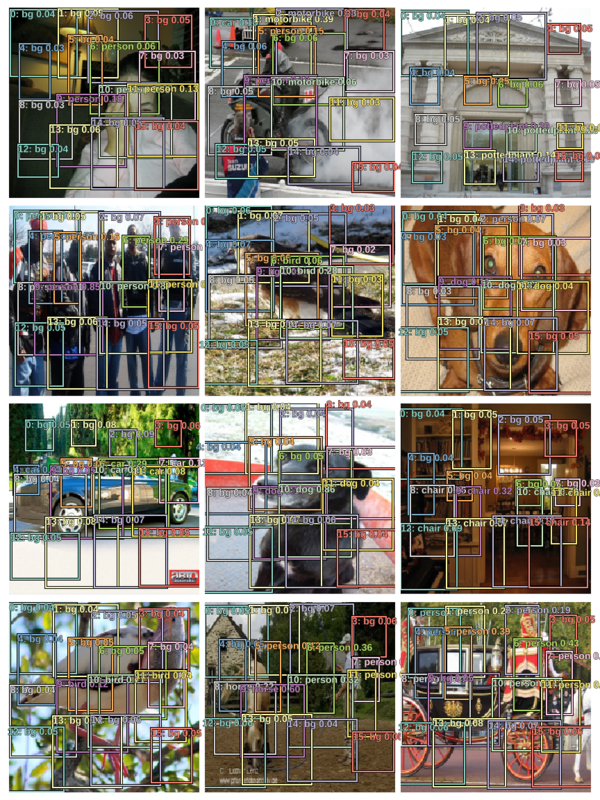 The default boxes tile the feature map in a convolutional manner, so that the position of each box relative to its corresponding cell is fixed. At each feature map cell, we predict the offsets relative to the default box shapes in the cell, as well as the per-class scores that indicate the presence of a class instance in each of those boxes. Specifically, for each box out of k at a given location, we compute c class scores and the 4 offsets relative to the original default box shape. This results in a total of (c + 4)k filters that are applied around each location in the feature map, yielding (c + 4)kmn outputs for a m × n feature map. Let's set up and plot these anchor boxes. I'll use a grid size of 4 x 4, and one anchor box at a given location for now, ie, k=1. Plotting the centers of these anchor boxes. We also need the corners of these anchor boxes. We know that the ResNet-34 backbone outputs a tensor of shape (batch_size,512,7,7) for this dataset. The custom head will first contain a convolutional layer with stride 1 which will only change the number of channels. 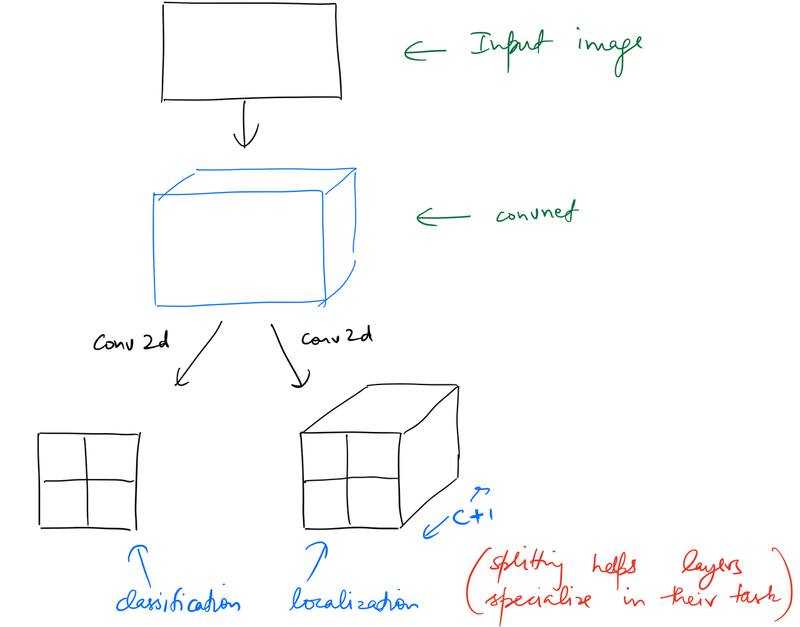 Then we'll add another convolutional layer which will decrease x,y dimensions to (4,4). Till this point, classification and localization tasks share all the computation performed by the network. Let's define a module that performs all of this along with BatchNorm and non-linearity at appropriate points. At this point in the network we'll split the computation for both tasks into individual convolution operations. This helps the network specialize a little bit more in each individual task. The last convolution for outputs a tensor with number_of_categories + 1 number of channels. We need to add 1 so as to predict background. Putting all of this in one module. To to sum of this up, the network for multi-object detection is based on a ResNet-34 backbone and has a custom head that has convolution layera that share computation for classification and localization tasks till the second last layer, whereafter two separate convolutional layers output two separate tensors corresponding to the two tasks. Let's define the custom head for this architecture. I'll set up the model and train it first, and then look at in detail step by step. Loss function takes in the following two lists for one entry in the data. Let's go through the logic used in calculating loss as well as the functions defined above step by step. Fetching a batch of ground truth and predictions. y is a list of two tensors containing bounding boxes and classes respectively (both of which are zero padded by fastai by default). batch is the predictions from the model, which as defined above, is a list of two flattened tensors for classification and localization respectively. Let's stick to one image (indexed at 7 in the batch) in the validation set to better understand these variables. There are 2 sets of bounding boxes here, ie, 2 different objects. Let's check out the classes. There's a person and a horse in this image. b_bb is the flattened tensor for bounding box prediction. Since we've specified 16 grid cells, we get 16 bounding boxes. Also, these numbers are scaled for an image of size (1 X 1). b_clas contains the predicted class scores for all 16 grid cells. get_y (defined above) unflattens the ground truth bounding boxes tensor, scales it down to the range [0,1], and removes the zero padding done by the dataloader. bbox, and clas are the ground truth bounding boxes and the classes respectively. Let's see these variables plotted on the image. show_ground_truth takes in numpy array of an image, along with arrays for bounding boxes, classes, and probabilities, and plots them on the image. Now we'll make use of anchor corners defined above to be a set of 16 grid cells which correspond to 16 preset bounding boxes. Since the model outputs 16 set of classes we can map them one-to-one and plot them. Note: torch.autograd.variable.Variable.max returns a tuple of tensors contains the max values and their indexes. For classes we're interested in the indexes of the max values. The following image shows the 16 preset anchor boxes and the predicted classes for all of them. Time to think about the loss function. This loss function will take the ground truth and these predicted bounding boxes and classes, and will result in a low value if these predictions are close to the ground truth. To achieve that, we need to first "match" these anchor boxes to the ground truth. We do that by figuring out which of the anchor boxes overlap most with the ground truth bounding boxes. To do this we need to have a metric to measure the amount of overlap. We use jaccard index for this, which is the ratio area_of_intersection/area_of_union. During training we need to determine which default boxes correspond to a ground truth detection and train the network accordingly. For each ground truth box we are selecting from default boxes that vary over location, aspect ratio, and scale. We begin by matching each ground truth box to the default box with the best jaccard overlap. Unlike MultiBox, we then match default boxes to any ground truth with jaccard overlap higher than a threshold (0.5). This simplifies the learning problem, allowing the network to predict high scores for multiple overlapping default boxes rather than requiring it to pick only the one with maximum overlap. To make things easier to visualize, let's plot both the ground truth bounding boxes and the anchor boxes on the same image. Here we can see that ground truth bounding box for person has an overlap with 8 anchor boxes. And the ground truth bounding box for horse has an overlap with 6 anchor boxes. Let's find the jaccard index for overlap of each one of the ground-truth bounding boxes with the 16 anchor boxes. overlaps is a (2x16) tensor containing the overlap scores for the 2 ground truth bounding boxes with the 16 anchor boxes. If we find the maximum of overlaps over dimension 1, we'll get a tensor of size 2 containing the maximum value of overlap for each ground truth bounding box, as well as the indexes of the corresponding anchor boxes. 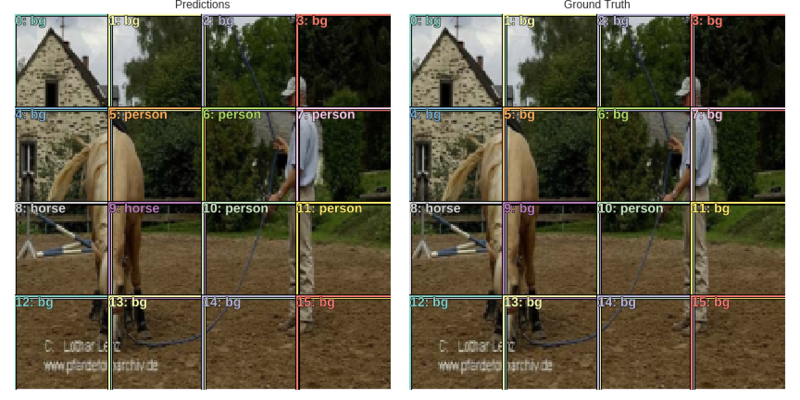 This means that person overlaps most with anchor box 10, and horse with anchor box 8. We can also find out the maximum over dimension 0 which tells us the class with which each anchor box overlaps most with. Now we'll use these two set of overlaps and assign each anchor box to a ground truth box using the logic stated in the SSD paper. We'll first assign a high score to the anchor boxes with which the ground truths overlap the most. In this example it's anchor boxes 10 and 8. Next we assign the anchor boxes to classes. Next we match anchor boxes to any ground truth with jaccard overlap higher than a 0.5. In this example only anchor boxes 10 and 8 exceed the threshold. Now the anchor boxes selected from the above logic are assigned to their corresponding classes. The rest are assigned background. Let's see the classes finally assigned to each anchor box. As expected, just two anchor boxes are assigned with objects, and the rest are background. We're done with the matching problem. We've taken the ground truth and mapped it to our model's convention of 16 anchor boxes, with two anchor boxes mapped to objects and the rest being background. It modifies the center and height-width of the anchor boxes according to the values of the activations resulting in predicted bounding boxes. 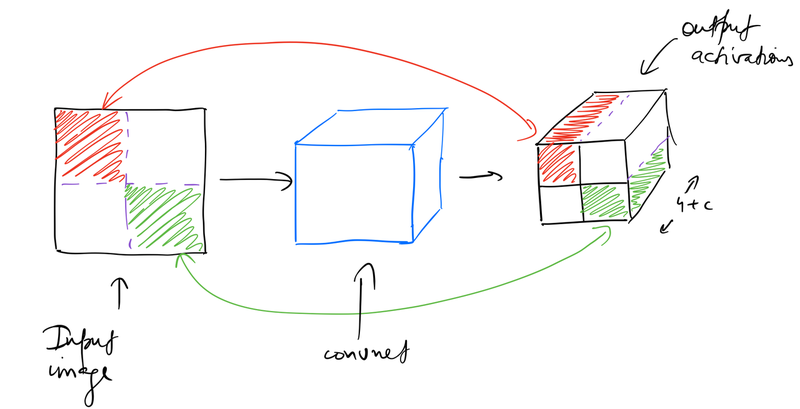 Let's take a look at the resulting bounding boxes for the example image. We also pass the class score probabilites to torch_gt to plot them. It's looks quite messy but is exactly what we expected it to be. We've got 16 predicted bounding boxes, and as we can see in the image above we have multiple bounding boxes predicting the location of the same object. Let's take a look at the predicted bounding boxes for all objects except background. Most predicted bounding boxes are covering only a part of the target object. This is due to the fact that the anchor boxes were small to begin with, as well as square in shape. The activations coming from the network can only increase or decrease the dimensions of these anchor boxes by 50% (refer to actn_to_bb) so that makes sense. For localization loss, we need to find L1 loss between the ground truth and predicted bounding boxes associated with the "matched" anchor boxes, ie, corresponding to pos_idx. We ignore all other predicted bounded boxes. Let's plot the bounding boxes which are used in calculating L1 loss. white is ground truth, and orange is the predictions. 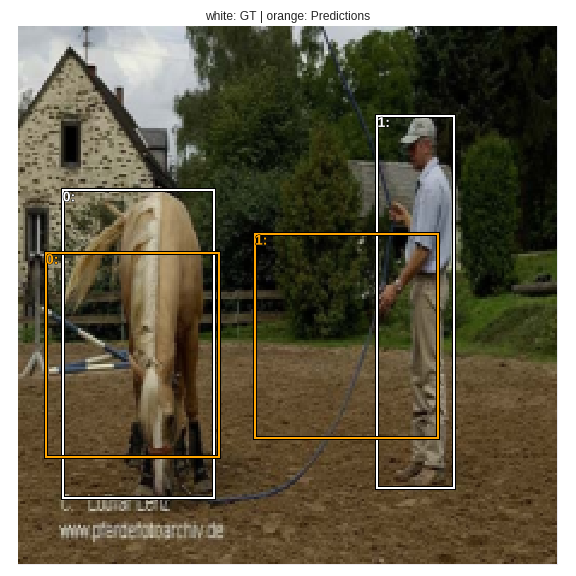 Localization loss is calculated between the white bounding boxes (ground truth) and the orange bounding boxes (predictions). Classification loss can be calculated as cross-entropy between classes predicted and ground truth classes (after matching). Let's check out the predictions on validation data. Since plotting bounding boxes for background doesn't make sense, let's skip those. We can also increase thresh so as to see skip bounding boxes for which class probabilites are very low. The model is able to predict multiple objects! Although, it's not doing great in the localization task, but that's due to the fact that the square and small anchor boxes chosen above only allow objects of certain shapes to be localized well. Also, the model is predicting multiple bounding boxes for the same object as evident in the above images. The SSD paper details various ways to deal with these problems. I'll describe them in upcoming posts.